Primary packing - 10ml white Poly bottles White caps &Nozzles..
10 ml in white poly bottles with white caps & nozzles in properly sealed. Povidone iodine is a kind of iodine disinfectant which directly cause in vivo protein denaturation, precipitation of bacteria, and further resulting in the death of pathogenic microorganisms. Therefore, it is effective in disinfection and sterilization. It can kill viruses, bacteria, spores, fungi, and protozoa with low toxicity to human. Povidone-iodineaqueous solution has strong pharmacological activity against Staphylococcus aureus, Neisseria gonorrhoeae, Pseudomonas aeruginosa, syphilis, hepatitis B virus, HIV, and Trichomonas vaginalis. Povidone iodine gel is a gynecological topical semi-mobile colloidal agent made by povidone iodine and hydrophilic matrix. It is a system for maintaining its sustained release. Owing to the continuous release of free iodine, it can enable the skin and mucous membranes to maintain a certain effective concentration of iodine for killing bacteria. It is mainly used for gynecological vaginal infection. It exerted its effect through being miscible with vaginal secretions and further killing the inside pathogenic microorganisms, and thus blocking the spread of sexually transmitted diseases and invasion, as well as treating other infected vaginal diseases caused by other kinds of bacteria. Published reports on the in vitro antimicrobial efficacy of iodophors demonstrate that iodophors are bactericidal, mycobactericidal, and virucidal but can require prolonged contact times to kill certain fungi and bacterial spores. Three brands of povidone-iodinesolution have demonstrated more rapid kill (seconds to minutes) of S. aureus and M. chelonae at a 1:100 dilution than did the stock solution. The virucidal activity of 75150 ppm available iodine was demonstrated against seven viruses. Other investigators have questioned the efficacy of iodophors against poliovirus in the presence of organic matter and rotavirus in distilled or tapwater. Manufacturers' data demonstrate that commercial iodophors are not sporicidal, but they are tuberculocidal, fungicidal, virucidal, and bactericidal at their recommended use-dilution. This medication is used to relieve dry, irritated eyes. The dose depends upon the need for lubrication. Usually 1-2 drops should be administrated into each eye three times daily, or as directed by your doctor. People who wear soft contact lenses should remove their lenses before putting in the drops and wait at least 15 minutes before re-inserting their lenses. Hypersensitivity to any of preparation ingredient. 1-2 drops 3-4 times daily in both eyes, depending on the severity of symptoms. Wash your hands before using the preparation. Shake the bottle and remove the cover. Ensure that the tip of the pipette does not touch the skin or the eyes surface to prevent the ingress of infection. Tilt the head back, pull lower eyelid down, turn the bottle and instill required number of drops in the conjunctival sac. 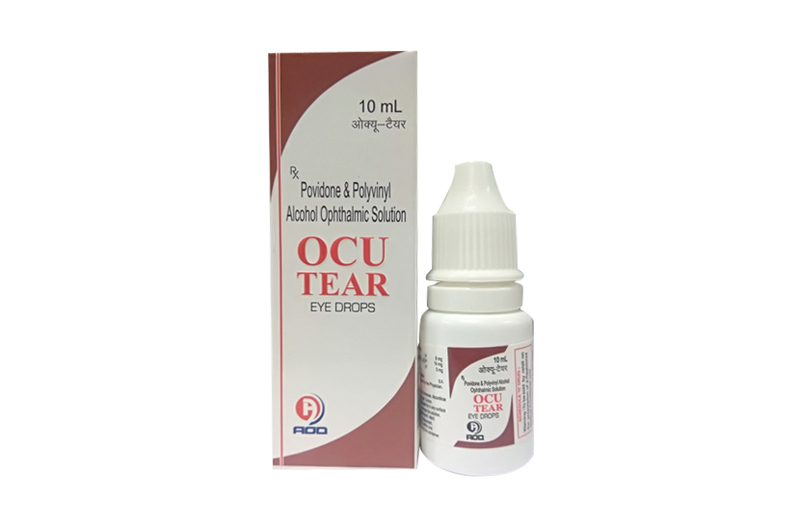 Ocutear-Eye Drops is supplied in 10 ml white Poly bottles packed with printed labeled in a unit carton and, Such 25 Carton Packed in a Shrink Sleeves.Such 12 shrinks packed in a shipper.